A group of representatives wants to force a vote on immigration reform in the House. If their discharge petition filed on May 9 receives enough support, it may lead to a vote on four bills that address security concerns and Dreamers, undocumented immigrants who came to the United States as children. 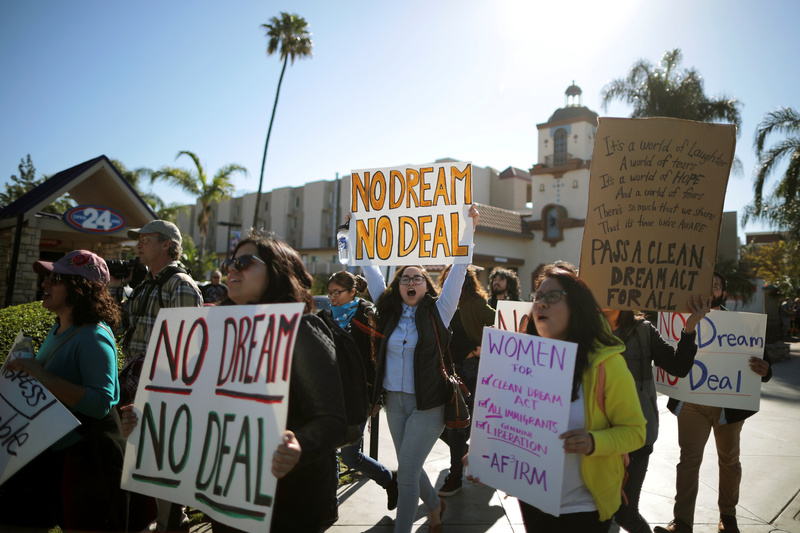 The bill with the most votes could, if it passes the Senate and is signed by President Donald Trump, replace the Deferred Action for Childhood Arrivals program. The program, known as DACA and instituted by President Obama in 2012, protects an estimated 690,000 Dreamers from deportation and gives them permission to work. Dreamers have lived in a state of uncertainty since the Trump administration announced its intention to end DACA last fall. “It’s encouraging that a bipartisan group of lawmakers are urging action, vote and debate on the DACA issue,” Ashley Feasley, the director of migration policy and public affairs for the U.S. bishops, told America. The bill with the most votes could, if it passes the Senate and is signed by President Donald Trump, replace the Deferred Action for Childhood Arrivals program. Representatives could collect the required 218 signatures for the discharge petition by early June. If that happens, the bills could be debated and voted on later that month. The bills range from the Dream Act, which provides a path to citizenship for Dreamers with no border security funding; to the United and Securing America Act, which includes funding for border security along with a path to citizenship for Dreamers; to the Securing America’s Future Act, which provides temporary legalization for Dreamers and the most robust security measures. The fourth bill would be chosen by House Speaker Paul Ryan. The U.S. bishops have voiced their support for two of the bills in the mix—the Dream Act and the more recent U.S.A. Act, a bipartisan bill introduced by Reps. Will Hurd (R-Tex. ), Pete Aguilar (D-Calif.) and Jeff Denham (R-Calif.) in January. “We are hopeful our support of the current version of the U.S.A. Act, and our continued support of the Dream Act, will encourage Congress to act now and find a humane legislative solution for Dreamers,” Bishop Joe S. Vásquez of Austin, Tex., chair of the U.S. bishops migration committee, said in a letter to House representatives on April 25. In addition to relief for Dreamers, the U.S.A. Act would fund new border security technology, increase the number of immigration judges and address root causes of irregular migration from Central America. “We have at this moment a bipartisan way forward that will strengthen America’s borders, improve conditions in Central America that are root causes of illegal immigration and will offer compassion to those who have come here seeking a better life,” Archbishop José H. Gomez of Los Angeles, vice president of the U.S. Conference of Catholic Bishops, wrote in his weekly column last month. Last month, a federal judge ruled that the DACA program could still accept new applicants, a decision that would stop the Trump administration from ending the program. Judge John D. Bates, however, did give the Department of Homeland Security 90 days to better explain why it ended DACA. Previous decisions have also questioned the administration’s termination of the program. But Ms. Feasley said these court decisions should not diminish pressure on Congress. The case could end up in the Supreme Court this fall ahead of midterm elections. “The uncertainty should pressure both parties to come to a solution,” she said, arguing that a Supreme Court decision in the matter would expose lawmakers’ inability get something done for Dreamers. A CBS News poll conducted in January found that 87 percent of respondents believed Dreamers should be allowed to stay in the United States. The U.S. bishops encouraged Catholics throughout the country to call their senators on behalf of Dreamers in February. While the bills debated in the Senate failed to move forward, the bishops hope the House will be more successful, according to Ms. Feasley. The Center for Migration Studies in New York estimates that there are more than 2.2 million Dreamers in the United States, though fewer than half are DACA recipients. The proposed legislation could address those who are not currently protected by DACA. Few want the Dreamers deported, but the illegal acts of their parents should subject the parents to deportation and should take away any "anchor baby" privileges that the law currently provides. Terms for allowing the Dreamers to stay should include removal of the immigration provision that makes babies born on US soil automatic citizens, as well as increased enforcement of existing immigration laws. Considering that all most American's ancestors did to be "legal" was step off a boat and that most Americans are "illegal" immigrants by definition (ask any Native American), what should be done is to continue a long history of welcoming those from other countries who come here to establish a life of working hard for their families and communities. The vast majority of undocumented and documented immigrants are incredibly hard workers, more so than many Americans who have been here for multiple generations.